These little guys look harmless enough...Skynet probably did too at somepoint. It has long been rumored that Twinkies last a really long time. However, I have personally conducted longevity experiments to determine their life span and have been sorely disappointed. Although it may be years before it is implemented on a large scale: there is hope for us all...Nano-structured Snack packaging is here! Last week, I wrote to you about the Europa Mission and how, due to budget cuts, it may not happen this year if at all. Well, at the time, the ESA was going to foot half the bill for the mission to make it BIGGER and BETTER. Now that NASA has made their short-sighted budgetary announcement/decision, ESA may not even be orbiting Ganymede which would have brought us closer, if not to, a possible alternative living sight. This is sad, sad news. I weep for our future in space exploration. However, if Mars is still on the table after this budgetary cycle, at least we'll have that to look forward to. But I'm not holding my breath. And also, if you would like to live in a fantasy world and pretend NASA still has foresight, check out this review of an iPhone App about the Europa Mission. And if you haven't checked out the game, download! I will let you know what I think but I already see a few similarities to my book. I will be signing books at the North Texas Book Festival on April 16, 2011. It is my first time attending this event and I am looking forward to fielding questions and speaking with fellow bibliophiles. The Europa Mission ... In Jeopardy? You may have realized by the many posts I have done advocating a "field trip" to Jupiter's moon, Europa, that I am an advocate of space exploration. Since NASA has pretty much phoned it in since the Moon landing, I am very excited about the possibility of either Mars or Europa visits by actual humans - and not robots - even if it doesn't happen in my lifetime. Well, we've fallen on hard times (or perhaps hard times have fallen on us) ... the whole world has ... but that seems to me to be an argument for GOING and SEEING instead of cutting the trips that could possibly provide another home for humans. Europa and Mars are relatively close to Earth ... and while traveling at the speed of light would definitely help other places to be more doable, I don't see that happening any time soon. So, with no further ado, please see below linkspam for all the latest, if not greatest, news about the Europa mission. 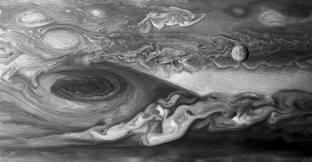 Budget cuts may mean Europa mission gets cut too. See also this story about the budget cuts. And another story about the budget cuts and a short overview of the potential mission. But then, here's what the smart people say and here's a short video of them saying it. And here is WHY they're saying it. And now you have the rest of the story. Stay tuned for further information. If anyone has any additional questions feel free to leave a comment on this post.